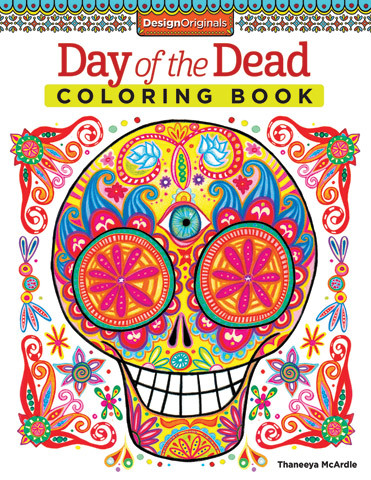 This coloring book features 30 creative art activities inspired by the Mexican holiday, Dia de los Muertos. Fun, exotic and full of psychedelic details, these intricate drawings are sure to spark your imagination and awaken your inner artist. Express yourself with fascinating images based on Day of the Dead sugar skulls. You'll love coloring this mystical folk art, from dancing skeletons to traditional nichos and papel picado. Each inspiring design is so detailed that you could spend hours on a single page. The book also provides valuable advice on coloring and patterning techniques, plus some colored examples to get you started. This inspiring coloring book for grownups is perfect for decorating with markers, colored pencils, gel pens or watercolors. Printed on high-quality, extra-thick paper designed to eliminate bleed-through. Each page is pre-perforated for easy removal and display.